I don’t think I’ve ever been so happy (or happy at all) to be in a room filled with 50 screaming, crazy, sweaty middle school students all on sugar highs, but the Global Party we organized for the Visions scholars was one of the best moments of the entire week. We started off the event by passing out cookies and soda to each student, a brave decision on our part if you ask me. We cleared a dance floor and though it took a little bit of coaxing, Regan did a great job of getting everyone dancing to the tunes he was playing from his cell phone through the microphone. Soon, all of the students and the volunteers were pulling out their best moves in a complete whirlwind of colors, laughing, whistling, shimmying, and total grooving. These kids all come from extremely disadvantaged families and communities, and many of them have faced more hardship than I likely ever will. It was a joy to provide a space for them to exercise their kid-ness to the fullest extent. It was absolutely a day that I will always remember, and I’ll be lucky if I ever become as good of a dancer as any of them. By the end of the camp, my hands were raw from multi-step high fives and my body worn down from the Global Party, but it was all worth it. Watching these kids transform a classroom of chaos – with miscommunication, nervous behavior and intermittent inattention – to a hub of productive and pointed organization churning out events and good ideas was inspiring. Most of the time, I just did my best to get out of the way of their unstoppable energy. Sometimes all an individual needs is a little space to realize their own potential and I truly believe that the Visions camp was exactly that. As someone who is interested in the way that a new generation of young people can become a positive force in changing the changing world, you can often find me extolling the virtues of my own generation – the Millennials – and the possibilities of a different world as we come into our own. The week at the Visions camp showed me that these future generations will keep that positive energy coming. There are some new kids on the block and they’re sharp, driven and ready to take the world by storm irrespective of their group’s gender, race, or background. Watch out. Visions Leadership Camps strive for students to gain self-confidence through fun activities, a simple premise that is complicated to implement. The camp is successful for two reasons: the children’s eagerness and the meticulously planned workshops led by a dedicated team. 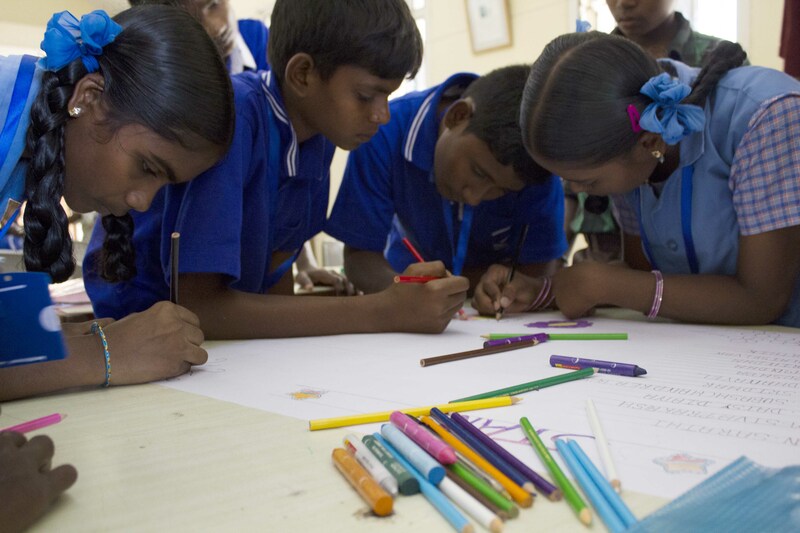 Greg Buie, our Visions coordinator, created and refined an entire curriculum of leadership profiles, games, and activities that are translated into beautiful Tamil books given to each student. 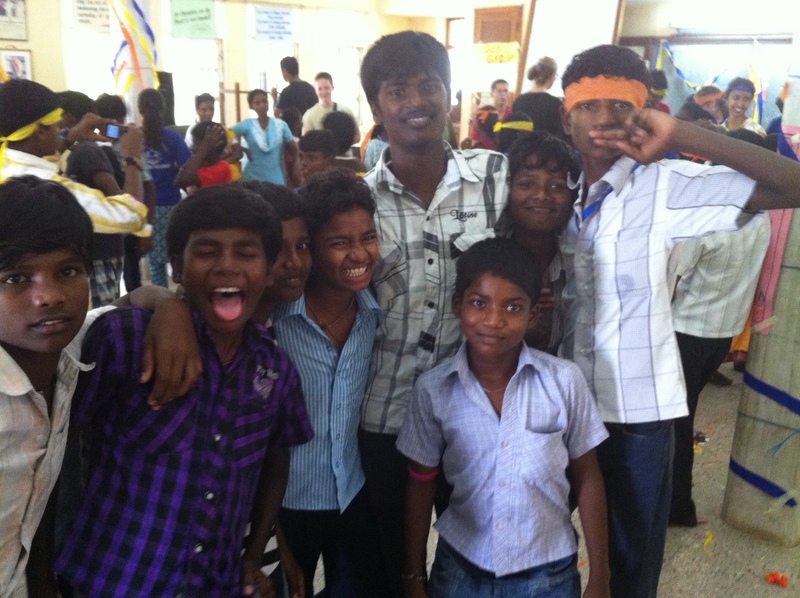 He also established partnerships with two dynamic translators, Reagan and Satish, which made a profound difference in communicating with the kids. But Greg, Reagan and Satish were guides rather than instructors, giving both the students and the Social Change Semester group freedom to learn, experiment and resolve on our own terms. Rather than claim that the students underwent a transformation during those five days, they were simply given an environment in which they could be their energetic, creative selves. Visions has established a unique and enriching experience for disadvantaged children that should be used in other contexts, such as the United States. The workshops help kids break out of their school’s rote learning methods and teach them to be their own teachers. Students learn that they don’t have to wait until adulthood to make a difference in their own communities, which is an encouraging message for both them and our Social Change Semester group. One of the pillars of effective teaching is effective communication. This is because learning happens when students understand something that is communicated to them and it changes or shapes the way in which they experience the world. It was a really interesting experience participating in the Visions Leadership Camp in the role of an instructor and being unable to speak the language that the students speak. The words that they heard me say were my own, but they were a version of my words that had passed through many cultural and linguistic filters. I didn’t realize the full magnitude of this when we began, but having engaging and thoughtful translators really helped things to go as well as they did. Not only is it difficult to communicate to a group through a translator and still be a teacher (and to be the translator relaying this information), but it is also difficult to communicate to a group of kids who are in the process of becoming adults but are still kids, and to get them to work together, to believe in each other, and believe in themselves. I guess that all communication goes through multiple layers of influence and interpretation, it is just that at the Visions Camp some of those layers were more apparent than they normally are. For me, this experience drew more attention to alternative forms of communication other than what goes on verbally, and I always think it’s nice to reaffirm the place of importance held by goofy dance moves within the world. 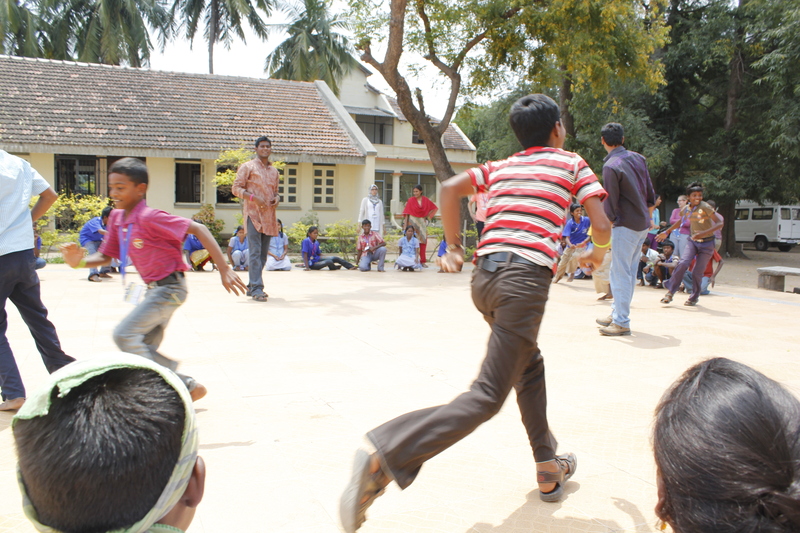 The Visions Leadership Camp was certainly one of the highlights of our stay in India. We started off the camp by taking turns introducing ourselves and telling interesting things about ourselves. I mentioned how I was looking forward to learning new things from the children and how I was very excited and happy that I finally had the chance to meet one of my childhood dreams: teaching! When I was a child, and whenever I was asked about my dream job I would always say that I wanted to be a teacher. Sometimes, I even pretended to have my own invisible class and I had a whiteboard in my room that I used to study some subjects. As I was explaining the lesson to myself, in my mind it was dedicated to “my class”. Growing up, I completely put aside that dream and never consider it to be my future career anymore. But it is funny how things turn out and how life leads us to live our own old desires and choices by coincidence. I finally got to teach an actual class with real pupils in India. That experience was challenging and tough to some extent, but certainly joyful and unforgettable. By the end of the five days, I realized how hard to be a teacher and how hard to control young energetic children, but once that skill is acquired nothing is more enjoyable and noble than to pass your own knowledge to younger generations eager to learn about your experiences and about the world. By the end of those five days, I also learned new Tamil words and sentences. It was so remarkable and impressive the way the young children taught us their language. They were seizing the tiniest opportunities to sit by our sides and ask us to repeat a Tamil sentence or word several times. That repetition process worked very well and whatever I was taught through that methodology wouldn’t be easily forgotten. The Visions Leadership Camp was a great opportunity for me because I was able to teach high school kids, and at the same time learned new skills and met new great people. “When do you leave for America?” Jilkghih asked. He responded in Tamil, and I searched my group of tiger cubs- a term of endearment for Tiger Group members- for a translator. One of the girls, Divya, giggled, “You take him to America?” Jilkghih pointed at me, himself, and the group. He didn’t only want the trip for himself, but for all of them. Some students focused intently on decorating posters and making badges for the poetry reading they’d organized for that afternoon, other’s listening to our conversation began to giggle. For them the idea of traveling to America was so intangible it was a joke. The request was enough to risk a bit of eye rain. This would be our last day with them and the hardest part of the Visions camp for me- leaving. I’d finally learned the names of all my tiger cubs and was even beginning to pronounce the names correctly. The week had gone so fast, each day packed with lessons and activities. The stress from busy schedules and the usual social issues that come with large groups of teenagers was nothing compared to the tensions on this last day. This end was the infuriating part, simply because I’d not get the opportunity to know them better. With boisterous voices and fierce attitudes, I watched as Silambarsan V., Manikanadan S.T., Divya V., Psathishkumav, R. Vertrivel, S. Sabina, S. Sudhakar, Jayasurya C, P. Salomya, J. Jlikghih, and Kumutha recited our group cheer: Clap, Clap, Clap-Clap-Clap, Tiger Group, Clap, Clap, Clap-Clap-Clap, RAWR! The pride all eleven tiger cubs exuded on our final day together was both tangible and contagious. But, then again, it would have been nearly impossible NOT to be completely overwhelmed by love and admiration for each and every tiger cub. Watching them all grow more and more empowered over the course of five days was nothing short of a privilege. S. Sabina, our Home Minister, took the first steps towards pushing past her fear of not being smart “enough” to be a leader, taking meticulous notes during all of our meetings and presenting them to the entire camp. P. Salomya, our Finance Minister and quietest group member, found the confidence to M.C our group’s poetry reading. Silambarsan V, one of our most rambunctious group members, began to not only give others the opportunity to share their thoughts but also listen closely to what others said. Although a week has passed, I remain in awe at just how phenomenal they all are. My only regret is that I will not have the chance to continue watching each tiger cub grow further into the beautifully intricate and individuals they are. Our time with the visions camp has hands down been my favorite week so far this semester. To me mentoring programs serve many purposes; the most important is making sure the children know they are important. At times it was hard to tell if they understood what we were trying to teach about diversity, teamwork, or the other lesson. However, when I saw they were smiling I felt instantly reassured that this experience was meaningful for them. My favorite moment was when they were thinking of the cheers. Our team decided to say “Right, left, success” giving a thumbs up. While the other groups were a little more creative, what mattered to me was the smiles from ear to ear that each of the kids had when they said SUCCESS! This week taught me that everyone will find their own meaning in mentoring programs. Some people will be more interested in the lessons, while others will find meaning in the opportunities provided to speak up, lead a meeting, or come up with a cheer. Appearance-wise Gokulraj was eight. Behavior-wise Gokulraj was eight. But in reality, he was thirteen years old. His small frame and ever eager expression never failed to bring a smile to my face. When he wasn’t struggling to stay awake during lessons, he would sit quietly smiling away. Initially, he wouldn’t say a word. By the end of the week, he would be sitting up straight and tugging on my shirt hoping to read the next passage in the lesson aloud. The transformation seen in these kids throughout the week was absolutely remarkable. They went from requiring explicit instructions of what to do to wanting to take charge and being willing to volunteer for anything. It pulled on my heart strings to see one of the most timid boys in my group get up in front of all of the students to sing a song for the talent show. What impressed me most is the resilience of these kids. After everything they have been through, they are still able to be so loving, generous, friendly and happy. These kids were absolutely inspiring. 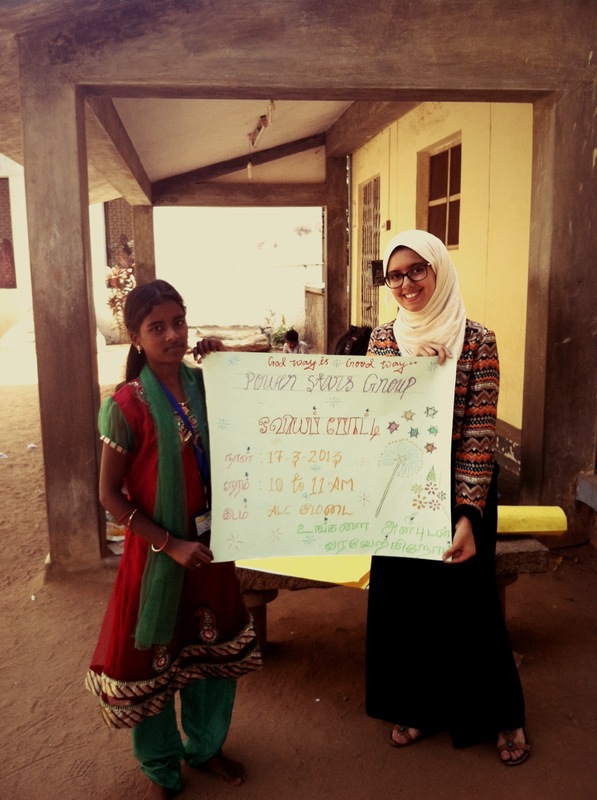 Visions leadership camp was one of the most enlightening and meaningful experiences I have had in India so far. The transformation between the first day of the program and the last was like something from a lifetime movie. All of that passion and brightness could so easily have gone unearthed. It was was inspiring to see how little it took, and sad to see how little it took to create such an enormous impact. It made me wish the world was smaller, and plane tickets were cheaper so that opportunities like these could become as frequent as they are special. I remember wanting so badly to say and do the most impactful things possible. I wanted to fill every parcel of time with “teachable moments” and waste no words on anything that was not utterly profound. But half way though the training I began to understand precisely what my most valuable asset was-my ears. What moved these children most was not the material we taught them, or the gifts we gave them. It wasn’t that we traveled 8000 miles, and spent 45 minutes on a bus every morning to teach them. It was that we had done all this to create an exchange. The beautiful thing about Visions camp was that our daily mission was not to simply impart knowledge. It was to tease out the autonomy, the perspective, and the initiative of each child. The goal was never to leave my voice bouncing around inside of a child’s head but rather to let him know that it was okay to turn up the volume of his own.